Understanding where energy consumption and loss occurs within buildings is necessary for developing a strategy to improve energy efficiency. As an important first step towards energy conservation, energy audits work to analyze energy flow within buildings and identify opportunities to optimize performance and better manage energy expenses. In conducting energy audits, a range of diverse information is collected and assimilated for analysis. This can include system performance data, energy usage, weather data, and information related to the building’s features and envelope. 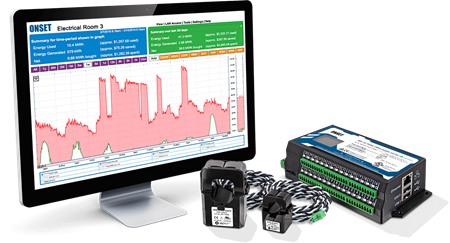 Onset provides a suite of industry-leading data loggers, sensors, and software for collecting and analyzing key information utilized in energy audits. Onset’s industry-leading tools allow energy auditing experts to capture accurate energy and performance data for characterizing the energy profile of buildings, managing peak demand, reducing energy losses, and ensuring the efficient operation of equipment, leading to better decisions for saving energy.